This is the symbol for Leo. Visually, it’s easy to pick out the form of the lion in this symbol. The mane of the lion is clearly seen in a stylized swoop, and its tail curling at the end is a visual trait of this powerful feline. More about lion-Leo connection is available further down this page. The zodiac symbols for Leo are more than just a representation of the lion. The closed circle is symbolic of the sun, Leo’s astrological ruler. The crescent of its mane is symbolic of the phases of the moon. Together, the sun and the moon in Leo’s symbol suggest a solid balance between emotion (moon) and intellect (sun). In other words, this symbol represents Leo’s ability to find harmony between head and heart. The closed circle in Leo’s glyph is also symbolic of completion, satisfaction and unity. That seemingly benign circle is more than what it seems. It is a symbol for connection...especially with the pride, which is Leo’s family, clan or group. 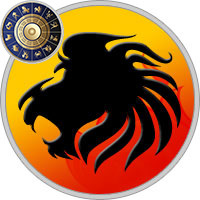 Seen this way, the closed circle (family or clan) is a source of Leo’s identity. Why? Consider the stylized tail swirling out of the closed circle. In iconography, this is a snapshot of the soul or consciousness (tail) being expressed from that which is core (closed circle). Put simply, Leo’s community is key and they finds their truest self through the "pride" of the people they keeps close. Fire: As the sun is Leo’s ruler, fire is the no-brainer element for this fiery sign. Fire is symbolic of passion, energy and creativity - all of which are prime attributes of the Leo personality. Fire is also symbolic of the soul or spirit. This isn’t necessarily a religious thing. Although Leo’s fire may be a metaphor for their spiritual status, it’s also a metaphor for Leo’s enthusiasm, zeal and temper. With all that exuberance, Leo’s can be super-charged in the heat of a combustible situation. Mess with a Leo’s "pride" (friends, family, etc), and you’ll see that fire ignite! Young lions can be quick to anger, but as a Leo ages, that temper is often transformed into a healthy need to protect loved ones. Leo’s also tend to get a little more humorous as they age too. This is when Leo’s fire comes out in the form of friskiness, playfulness and laughter. Sunflower: The symbolic meaning of the sunflower deals with seeking self-expression. This expression often comes in the form of leadership. Whether it’s unfurling bright skills at the workplace, or sprouting into leadership within the home, the sunflower is an upright symbol for leadership growth. Sunflowers are also symbolic of friendship, sharing and being open to new environments. Leo share these same qualities. Often adventurous, with open-minds, Leo’s typically thrive out of their comfort zones. Some of Leo’s best growth spurts come when they travel, because it satisfies a thirst for adventure while encouraging connection with their new environment. Sunflowers move their heads in the direction of the sun. Leo’s do too, in a sense. When Leo has a positive focal point, they can move attention to keep themselves within view of that light. This could be in the form of family, sense of self, or work. To be sure, when there is a bright sun (goal or object of desire), Leo will direct themselves to it with confidence and determination. Ruby: The ruby is a reflection of Leo’s sparkly, multi-faceted, fiery personality. Rubies are symbolic of fidelity, confidence and faith. Leo’s are encouraged to wear rubies to enhance their sense of loyalty to a group or cause. When worn by a Leo, rubies can also augur calm and clarity. This is an excellent influence if a Leo is going through bouts of anger, frustration or confusion. Worn at social functions encourages a Leo to be more charming than usual. The ruby’s warming properties coaxes a jovial, highly communicative side in Leo. Rubies are also outstanding stones for protection and are said to safeguard Leo’s from physical harm. Lion: There’s a reason lions have earned the title of "king of the jungle". 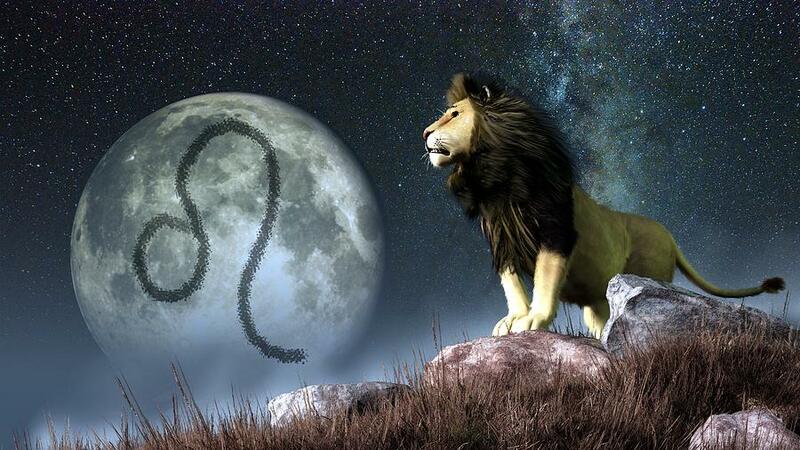 Regal, majestic, powerful and dominators of their territories... Leo’s can share these same qualities with the lion. Females are highly productive in society. So are female Leo’s. They shine brightly when caring for their cubs. They also do the "lions share" of hunting for the pride. A healthy She-Leo is a go-getter, takes immense pride in caring for her family. She is able to utilize enormous amounts of energy getting her work done for the good of the community. Male lions are all about fierce protection, and so are male Leo’s. Do not mess with a He-Leo’s territory. Whether he feels a need to protect his family, his integrity or his position at work - a male Leo will bear fang and claw to insure his rightful possession or position is intact.